Wondering how SEE got started and looking for more general information? 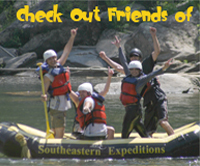 Curious about the Chattooga River and rafting on wild and scenic rivers? You have come to the right place! For promotional photography or video or to request images for editorial or broadcast use, please contact Brent or Dusty Rogers at the phone number listed below. Please note: Southeastern Expeditions is not licensed to share all the photography on our website. The unauthorized use of stock imagery copied from our site could result in a fine.